Bhairavi has experience in public policy, research and service delivery. She has developed and implemented significant policy reform agendas across the Australian and state governments and has productively engaged stakeholders from a variety of sectors to achieve outcomes. 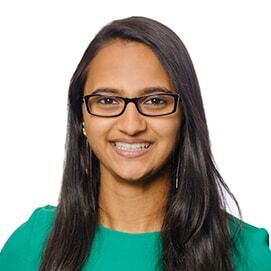 With a background in psychology and academia, Bhairavi is a critical thinker and applies a sensitive understanding of human factors to solving problems. Led and delivered a road safety peer-education program across secondary schools in Victoria; in partnership with police, fire services and local governments. Prior to joining Nous, Bhairavi worked at the Victorian Department of Health and Human Services and the Australian Government Department of Social Services. She holds a Bachelor of Psychology (Honours) and a Diploma in Languages (French) from Monash University, and completed Data Analytics Module: Using Data to Evaluate Policy at the Australian National University. Bhairavi is a performing violinist, trained in the western classical and South Indian classical art forms, and spends weekends and holidays travelling across Australia and internationally to play concerts.